Cuemaster (formerly Image-Ination) has more than 15 years of experience in providing camera crews to national and international clients. 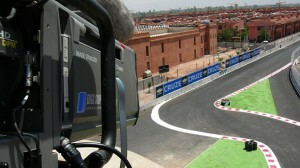 Our main field of experience is ENG/EFP camerawork and multi-camera and OB work. For ENG/EFP work we can supply you with HD cameras (we prefer Panasonic P2, Canon C100 or Canon 5D) or the more cost effective XDCAM EX cameras. We can also provide you with an Avid Media composer edit suite to edit the images we shot. This unit is portable so it can also be used wherever we are shooting. Our crew speaks fluently Dutch, French, English and Spanish. In the field of multi-camera and OB work we are specialized in sports and music productions. We’ve worked on a variety of productions both in Belgium and abroad. Contact us if you are in need for an experienced, motivated and flexible camera crew.